Breon Borders [Statesville (10-1) versus Enka (5-6)]: Cornerback Borders intercepted a pass in the third quarter as Statesville advanced to the second round with a 65 - 12 rout of Enka. "We won big. They didn't throw to me at all, but I expected that," said Borders. "The one time they did throw it I intercepted it." Quay Chambers [Monroe (8-3) versus Bishop McGuinness (5-6)]: Chambers threw two touchdown passes as Monroe blitzed McGuinness 69 - 0. Bryon Fields [Charlotte Providence Day (7-4) at Country Day (9-1)]: Providence Day won 24 - 14, and cornerback Bryon Fields described his game performance as follows: "I had 200 plus yards of total offense with 190 on 13 carries, mostly out of Wildcat. And I had several tackles and a pass break-up on defense. We play Charlotte Christian next week for the private school State Championship." Josh Cabrera [Jacksonville Northside (11-0) versus Croatan (6-4)]: Wide Receiver Cabrera caught two touchdown passes as Northside defeated Croatan 47 - 10. Overall, he had three receptions for 64 yards with the touchdowns covering 12 and 10 yards. Cabrera also caught a 2-point conversion pass after Northside's fourth touchdown. Kendall Hinton [Southern Durham (6-4) versus Wilmington Hoggard (8-2)]: Quarterback Hinton threw two interceptions in Southern's Durham's 28-26 defeat at the hands of Hoggard. When added to a fumble and a missed PAT, there were just too many mistakes for Southern Durham to overcome. Their season ends at 6-5. In Virginia, Jake Kite and Evrett Edwards were in action attempting to help their teams secure spots in the upcoming VHSL playoffs. Kite had a big game as Hidden Valley defeated Cave Spring 21 -12. He ran for a 20 yard touchdown on a reverse. "We earned a first round bye for getting the win last night," said Kite. "I had two rushes for 62 yards and nine tackles." Woodbridge knocked off previously unbeaten Stonewall Jackson 17 - 7. "We beat the ninth ranked team in the state to clinch a playoff berth," commented Edwards. "I had an interception and three tackles." Moving south to Florida, Johnell Barnes and his Dunbar teammates improved to 8-1 with a 35 - 0 victory over Booker, while T.J. Douglas led Fort Myers to a 48 - 7 win over Bishop Verot. "It went well," Wide Receiver Barnes said. "We won 35 - 0. I had two catches for about 65 yards and a touchdown. I played quarterback mostly the whole fourth quarter. District champs." Douglas and his Fort Myers teammates failed to qualify for the post season. In Georgia, Walker improved to 9-0 on the season with a 20 - 3 win over Mount Paran Christian. Defensive Tackle Mike Ramsay was ejected from the game for a late hit out of bounds. He describes the play, "I had a couple of really nice tackles, but I got tossed...I ran the kid out and we were both falling - it was an awful call in the middle of the fourth quarter, but an amazing game." Down in Texas, offensive lineman Sterling Korona and his Reagan (San Antonio) teammates defeated Churchill 37 - 24. "Our offensive line had a monster night," Korona said. "Our running back, Elijah Ball, had 330 yards and three touchdowns, and our quarterback had two touchdowns on the three or four passes he threw." Also in Texas, offensive lineman Austin Davis and Mansfield prevailed 27 - 20 over Cedar Hills. Davis commented, "We have won four straight and are doing great as a team!" Out west in California, wide receiver Darren Andrews and Bishop Amat fell to Notre Dame 49 - 28, while running back Joseph Ajeigbe and Norco defeated King 29 - 8. Defensive back Breon Borders and his Statesville (NC) teammates wrapped up the North Piedmont Conference Championship with a 56-6 rout of South Rowan. The Greyhounds finish the regular season at 10-1, and are the third overall seed in 3AA West. They host Enka (5-5) this coming Friday. Charlotte Christian defeated Providence Day 24-16. Providence Day cornerback Bryon Fields is Duke's most recent verbal commit; Bryon recently won the Power 98 Athlete of the Week Award. Providence Day (7-4) will play at Charlotte Country Day (9-1) next Friday in the first round of the NCISAA playoffs. Two-way player Quay Mann rushed for 44 yards on 10 carries in a losing effort as Northern Nash fell to Rocky Mount 26-9 to end their season with a disappointing 2-8 record. Hidden Valley (VA) fell to 5-4 on the season after bowing to undefeated Salem (9-0) by the score of 24-14. Jake Kite caught six passes for 49 yards in the contest. The Titans play Cave Spring next Friday in their regular season finale. Defensive Back Evrett Edwards caught seven passes for 69 yards, but Woodbridge (VA) was upset by Forest Park 21-19. Woodbridge must beat Stonewall Jackson next week in their regular season finale to qualify for the playoffs. Dual threat quarterback Parker Boehme did not play as Jacksonville (FL) Sandalwood dropped a controversial 17-16 decision to Flagler Palm Coast. Boehme was in a walking boot this week and is most likely out for the season after re-injuring a toe in last week's win over DeLand. Quarterback T.J. Douglas ran for touchdowns of 77 and three yards and threw a 32-yard touchdown pass as Fort Myers defeated Ida Baker 30-27. In California, Norco improved to 5-4 on the season with a 56-16 shellacking of Corona. Running back Joseph Ajeigbe rushed for 101 yards and a touchdown on four carries. His touchdown run covered 68 yards. Wide Receiver Darren Andrews caught a 68 yard touchdown pass in the 4th quarter as Bishop Amat (CA) defeated Loyola 30-20. In the 2nd Quarter, Andrews scored a touchdown on a screen pass that covered 60 yards. Overall, Andrews caught eight passes for 176 yards. Walker (Marietta, GA) scored with 38 seconds remaining in the game to improve to 8-0 with a 21-14 victory over Whitefield Academy. Defensive tackle Mike Ramsay stars for Walker. Northside defeated East Duplin 21 -14 to win the East Central Conference Championship and complete a perfect 11-0 regular season. The Monarchs are the #1 seed in the 2AA East and host Croatan (6-4) this coming Friday. Northside previously defeated Croatan 41-13 back on September 28. Northside wide receiver Josh Cabrera is a Duke recruiting target. Southern Durham and quarterback Kendall Hinton host Wilmington Hoggard in the first round of the 4A East Play-offs. Shai McKenzie rushed for 323 yards and six touchdowns as Washington (PA) defeated Waynesburg 69-6 to finish the regular season undefeated at 8-0. Welcome back Blue Devil faithful for another edition of Friday Night Lights, where Blue Devil Nation takes you on a national tour covering all the high school action from North Carolina to California and back. This week's action kicked off on Thursday night in Florida as Quarterback Parker Boehme and Jacksonville Sandalwood defeated DeLand, 28-14, in a nationally televised game on ESPNU. Sandalwood improved to 5-2 on the season. Boehme completed 10 of 18 passes for 122 yards including an 11 yard [private] touchdown pass. He also rushed for 123 yards on 18 carries. Also in Florida, Quarterback T.J. Douglas threw a 60 yard touchdown pass and ran for two touchdowns of 90 and 11 yards as Fort Myers defeated North Fort Myers 41-7. In North Carolina, Duke's most recent verbal commit, cornerback Bryon Fields, lamented Providence Day's tough loss. "We had a tough loss, 17-7 to rival Country Day. They really did a lot to keep the ball out of my hands on offense and special teams and stayed away from me on the pass, but I played decent run support and I still had four or five catches. I had eight touchdowns in the previous 3 games, so they really made an effort to limit my production." In Virginia, Hidden Valley defeated Pulaski 14-10. Safety Jake Kite described his performance, "It went really well...I had an 89 yard kick return for a touchdown with 40 seconds left in the 1st half, and I had 15 tackles, three tackles for loss, I forced a fumble and had three catches for 40 yards." Also in Virginia, Woodbridge lost to Hylton 20-15. Woodbridge kicked a 20 yard field goal to take a 15-14 fourth quarter lead before Hylton return the ensuing kickoff 67 yards for the winning touchdown. Cornerback Evrett Edwards of Woodbridge commented on his performance, "I did well with two catches for 62 yards, a kickoff return for 48 yards, a pass break-up and a fumble recovery." Walker (Marietta, GA) defeated Kings Ridge Christian 24-6. "I blocked a punt and had two sacks," said Defensive Tackle Mike Ramsay, "The game went great and we are 7-0." In Texas, Mansfield Offensive Lineman Austin Davis described his team's 37-16 victory over Duncanville: "Our defense came up huge and our offense wore down their defense. We pulled together as a team!" In California, running back Joseph Ajeigbe rushed 19 times for 117 yards and two touchdowns as Norco shut out Roosevelt 37-0. Ajeigbe scored on runs of 18 and 2 yards. Finishing up the 2013 coverage in North Carolina, Cornerback Breon Borders intercepted a pass in the second half as his Statesville squad defeated East Rowan 59-39. Wilson Fike doubled up Northern Nash 42-21. "We lost again," commented cornerback Quay Mann, "I rushed for one touchdown, but didn't do much on defense. It's stressful when the opposing QB doesn't even look my way. I've only been thrown at three times this season!" Quarterback Kendall Hinton tossed a 46 yard touchdown pass with 30 seconds remaining in the game to rally Southern Durham to a 27-23 victory over Northern Durham. Josh Cabrera caught a 10 yard touchdown pass in Northside's 34-0 shutout of Clinton. Northside improves to 10-0 on the year and hosts 9-1 East Duplin on Friday night to determine the ECC Champion. Finally, the second section of this article describes Pennsylvania running back Shai McKenzie's statistics. McKenzie has averaged 36.2 yards per carry on his 24 rushing touchdowns this season. Welcome back for another tour around our great country as Blue Devil Nation brings you up to speed on all the high school action from North Carolina to California and back. "Big Plays" is the theme for this week's edition of Friday Night Lights. Duke 2013 verbal commits combined to return a punt for a touchdown, recover an onsides kick, and score a number of touchdowns on receptions and runs. A couple of 2014 targets had big performances as well. Safety Jake Kite returned a punt 59 yards for a touchdown as Hidden Valley (VA) shut out Christiansburg 28-0. Hidden Valley's record stands at 4-3 on the season. Kite commented after the game, "It went well. We played very good defensively. I had a 50 yard punt return for a touchdown." Breon Borders recovered an onside kick to help Statesville (NC) secure a 37-27 victory over Alexander Central, and improve its record to 8-1. The Greyhounds rallied from a 27-20 deficit by scoring the game's final 17 points. Ft. Myers (FL) Dunbar defeated Clewiston 40-30 to move to 6-1 on the season. After being named homecoming king before the game, Dunbar wide receiver Johnell Barnes caught a 13 yard touchdown pass in the 1st quarter . Blue Devil Nation congratulates Barnes on both successes. Barnes stated afterwards, "I had one catch for a touchdown. We mainly ran the ball." Quarterback T.J. Douglas had a tough night as Fort Myers lost to South Fort Myers 14-3. Douglas completed only 3 of 13 passes for 35 yards, and threw two interceptions, while gaining just 40 yards rushing on 20 carries. With back-to-back district losses, to Island Coast and South Fort Myers, Fort Myers' (5-2) playoff hopes are in jeopardy. In California, wide receiver Darren Andrews caught 10 passes for 130 yards and ran for two touchdowns, but Bishop Amat suffered its first loss of the season, falling to Alemany Mission Hills 56-35. Bishop Amat is now 5-1-1 on the year. Also in Southern California, Norco fell to Centennial 38-37 on a field goal with three seconds remaining in the game. The final margin was due to a missed extra point. Norco running back Joseph Ajeigbe explained the end of game sequence: "We led the whole game. We were on the four yard line with 1:57 to go when an illegal motion set us back 10 yards. Coach decided to go for it on 4th down and we didn't get it. They drove down and kicked the field goal to win as time expired." Norco's record fell to 3-4. Northern Nash (Rocky Mount, NC) fell to Southern Nash 33-7. Quay Mann returned a kickoff 58 yards to the 24 yard line, but the ensuing drive sputtered due to penalties, and produced no points. Mann commented after the game, "We had a tough loss. I finished the night with 200+ all purpose yards and five tackles." Defensive Tackle Mike Ramsay led a Walker School (Marietta, GA) defense that completely shutdown Fellowship Christian's offense in a 54-7 shellacking. Discussing the game, Ramsay stated, "It went well. We are still undefeated and I had a nice quarterback sack." Walker improved to 6-0 on the season. Evrett Edwards ran for a 26 yard touchdown as Woodbridge (VA) upped its record to 5-2 by defeating Freedom 41-0. Edwards commented, "I had a pass broken up, three tackles, three catches for 38 yards, and four rushes for 47 yards." Mansfield (TX) defeated previously unbeaten Midlothian 49-35. Mansfield offensive lineman Austin Davis commented, "We rushed for 375 yards and had 31 first downs. We dominated their defensive line and our defense stepped up big." Mansfield evened their record at 3-3. In San Antonio, Texas, Reagan HIgh dropped a 24-21 decision to Madison. Reagan offensive lineman Sterling Korona explained, "We came back late...if we had two more minutes, we would have won. We were definitely the more physical team." Running Back Shai McKenzie rushed 28 times for 295 yards and three touchdowns as Washington (PA) High rolled over Mount Pleasant 34-14. Wide Receiver Josh Cabrera caught a 15 yard touchdown pass and corralled two interceptions as Jacksonville (NC) Northside defeated Richlands 40-13. Quarterback Kendall Hinton threw four touchdown passes in Southern Durham's 47-10 victory over East Chapel Hill. Overall, Hinton was 12-21 for 246 yards. Tight End Avery Edwards caught a 15 yard touchdown pass, but Ravenscroft came up on the short end of a 17-14 final against North Raleigh Christian. That is all for this week. Be sure and check back next week for another edition of Friday Night Lights here at Blue Devil Nation -- the number one site for Duke football coverage. Johnell Barnes caught 2 touchdowns as Dunbar improved to 4-2 on the season. Blue Devil Nation welcomes back its loyal readers to another edition of Friday Night Lights. With the last Friday night of September in the books, gridiron action has kicked into high gear across the United States. 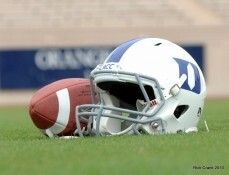 This week, in addition to checking in on many of Duke's 2013 verbal commits, BDN expands its coverage to include reports on several prospects in the high school class of 2014. Over in Charlotte, NC, Statesville routed Carson 56-13 as the Greyhounds improved to 6-1 on the season. 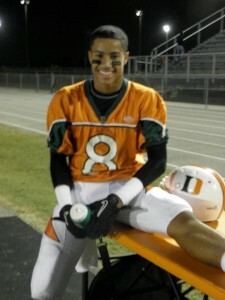 Cornerback Breon Borders commented afterwards, "It went okay! We crushed them by 40. I always can play better though. Overall, it was an easy win." Borders was credited with six solo tackles in the win. Ft. Myers (FL) quarterback T.J. Douglas summed up his performance in his team's victory over Charlotte High, "I had 218 yards rushing, two TDs rushing, two TDs passing, and 270 all purpose yards." Fort Myers defeated Charlotte 36-31 to stay undefeated at 5-0. Staying in Ft. Myers, FL, Johnell Barnes caught a 5 yard touchdown pass in the 1st quarter as Dunbar defeated LaBelle 39-6. After the game, Barnes commented, "It went well. I had seven catches for about 100 yards and two touchdowns." Dunbar improves to 4-2 for the season. Parker Boehme and Jacksonville (FL) Sandalwood defeated Parker 7-6. Boehme passed for 128 yards including a 36 yard touchdown, while rushing 14 times for 70 yards in the victory. Sandalwood's record is now 3-2. In Texas, Mansfield faced crosstown rival Timberview and ended up on the short end of a 36-20 score. Offensive lineman Austin Davis commented, "It was a tough game. I did really good and shoved my guy around." Jake Kite and Hidden Valley High School of Roanoke, VA ran to a 35-12 victory over Bassett to run their record to 2-3. Going into this week's game, Kite's statistics included 12 receptions for 198 yards and four touchdowns, but Hidden Valley only attempted two passes in this game. On defense, coming into the Bassett game, Kite had recorded 36.5 tackles, including 28 solo takedowns. Also in Virginia, Evrett Edwards and Woodbridge defeated Osbourne 27-7 to improve to 4-1. Out in California, Joseph Ajeigbe and Norco fell to nationally ranked Mission Hills Alemany 27-13. Ageigbe rushed for 174 yards and two touchdowns. Norco is 3-2 on the season. Bishop Amat and WR/DB Darren Andrews defeated Culver City 31-7. Last week QB Kendall Hinton led Southern Durham to a 36-7 victory over Person. In this video clip, you can see Hinton, number 2 in red, throw a nice tight spiral for a touchdown. Josh Cabrera caught an 84 yard touchdown pass and returned a punt 53 yards to set up another score as Northside (Jacksonville, NC) crushed Croatan 41-13. LB Zavier Carmichael and St. Paul's (Mobile, AL) defeated Choctaw County 42-8.